These simple tables should be of help in deciding on what your effective level of technical competence is in mountaineering and ski-mountaineering. Many of you will probably find them useless and/or incomplete, but our aim is to help enthusiasts to understand in what areas they feel technically independent and where, on the other hand, they may need more instruction in order to improve. An area dealing with personal experience is evidently missing here, but being so subjective it cannot be listed. Please bear in mind, however, that technique alone in the mountains is not sufficient to guarantee you safe mountaineering outings. In reality, there’s a whole lot of knowledge that one acquires only by being continuous in these sports and, in particular, by being with experts who will teach you. The programmes matched with the levels of competence have been specifically devised so that participants can improve and acquire a higher level of technical competence, in a gradual and regular manner. These are just a few of the options available with Horizon Montagne. We are open to any suggestions or proposals, however, that may satisfy your aspirations. Now take a look at your level of technical competence…. Level 0 – Beginner. You are a hiker who can walk for 6/8 hours, also on exposed trails at medium altitudes (2000-2800m.) and, in some cases, on stony ground or short stretches of moraine. Level 1. You are capable of walking, with crampons, on a glacier with a 20°/25°- angle slope and can climb on rock and on a “via ferrata” ,in ascent and descent of I°-II° degree difficulty on rock face of maximum 20/25m. in length with only short vertical stretches. You’ve already climbed a few easy peaks in the high mountains where, on ice, you had to use an ice-axe for support and on rock, for stretches of 10-15m., you had to use your hands for grip and balance. Level 2. You are capable of moving with ease, wearing crampons, on complex glaciers and on snow and ice slopes/couloirs for short stretches (15/20m.) of maximum 40°-45°angle slope using 1 or 2 ice-axes. You can climb, wearing crampons, on I°-II°degree rock and in the high mountains you do climbs of F/PD difficulty where the use of the hands becomes a priority on some stretches. On solid rock, you can climb up to 4° degree level, as second of the roped team, also on stretches requiring two pitches (100m. in length) with short vertical sections (3/4m.) and descend by rappelling. Level 3. You are used to climbing and descending on 40°-50° angle snow and ice slopes/couloirs , even on long stretches (100m. or more) and on mixed terrain (both ice and rock) and you can climb on rock, wearing crampons, up to advanced III°. In the high mountains you are at ease doing climbs of PD level with short sections of AD, also on exposed ridges. On rock face you are confident climbing at 4° angle as second of the team and you’re starting to manage some short 5° sections, even on routes of 200-250m. of altitude difference. Level 4. You are at ease and secure in ascending and descending short sections of slopes/couloirs at 60°-70° angle using one or two ice-axes and can climb on 4° rock, wearing crampons. You are used to climbing in a roped team at I°-II° degree, wearing crampons, on ridges, 40°- angle slopes, couloirs of snow, ice or mixed terrain. On rock, you normally climb second on a pitch at 5° degree with short, more demanding sections, on routes of various length (200-250m. ), in the high mountains too, wearing a rucksack. Level 5. You are an accomplished climber who habitually does climbs in the high mountains on ice and mixed terrain of D/D+ TD difficulty, even covering an altitude difference of 500m., of an overall duration of 10 hours or more and where progression in a roped party is a priority. On ice you can contend with slopes up to an 80° angle. 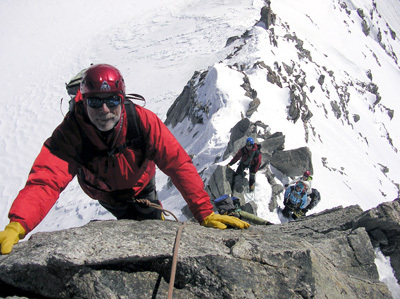 On rock face you are used to scaling second on the rope in the high mountains on routes of over 300m. of altitude difference with continuous sections of 5c-6a difficulty and short more challenging stretches, wearing a rucksack – the overall duration being up to 7/8 hours. Level 6. You are a highly skilled mountaineer, used to climbs on rock, ice and mixed terrain of advanced technical and physical difficulty that may even require bivouacs on the mountain face. In the high mountains you do long climbs (2 days) of TD difficulty. On ice you often climb on slopes of 80° angle and on short stretches of 90° angle, on one or more rope pitches. On rock face you climb normally as lead climber on mono pitche /itinerary of 2/3 pitches up to 6b with spit protection and as second of the party in the high mountains on sections of continuous 6a difficulty requiring consecutive pitches (300m. or more of altitude difference). Level 1 – Intermediate Piste Skier. Ski blues and reds at a good pace, but icy black runs and moguls are something of a survival zone. On forays off piste you generally struggle to stay upright! Like ly to say: ‘I want to ski black runs well + start off piste skiing’. Level 2 – Intro Off Piste Skier. (Advanced Piste Skier) Cruise reds, black runs are challenging but fun and have ventured off piste with varying degrees of success (ie deep snow is still something of a mystery…). Like ly to say: ‘I’d love to learn how to ski well off piste and/or try ski touring’. Level 3 – Improving Off Piste Skier. Enjoy black runs and the kind of tracked out off piste terrain found around many big resorts, but you haven’t skied too much in properly deep snow without a base to it yet. 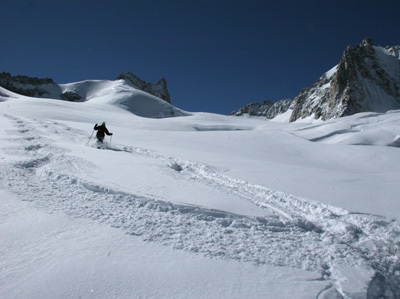 Like ly to say: ‘I’d like to ski well in powder/link lots of short radius turns/go ski touring’. Level 4 – Confirmed Off Piste Skier. You can put down a reasonable set of tracks in powder, but difficult snow types – heavy wet snow, crusts, poor visibility or 40dg slopes can all cause problems (though you can cope with them safely, if not elegantly!). Like ly to say: ‘I’d like to handle difficult snow/steep slopes more confidently in better style’. Level 5 – Advanced Off Piste Skier. Can put turns in through heavier snow and on icy 40dg slopes, but difficult breakable crusts and skiing a fresh track off piste in zero visibility are still somewhat challenging!. Like ly to say: I’ve been skiing ten/twenty years – I’d like to do your ‘……’ tour. Our Advice: You will enjoy our advanced level trips. If you are new to touring – then you could do a Haute Route with a day or two of skills training beforehand (but don’t overlook the physical fitness needed as well). Mileage is the best way to improve your ability level. Level 6 – Expert Off Piste Skier. Can ski all snow types including crusts in control and are happy on slopes of 45dg or when putting in a fresh track in zero vis. Like ly to say: ‘Bring it on…’.